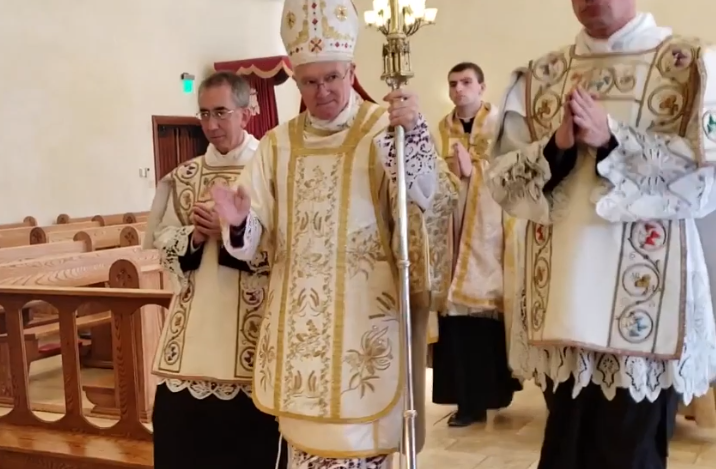 I was honored to be present for the solemn pontifical Mass for the feast of Candlemas at Saint Thomas Aquinas Seminary on February 2nd, and the end of the nearly four-hour liturgy had a nice surprise. Listen! A few people noticed that I was tapped to do some singing for Holy Week and the Triduum. It is a long and ugly story but the short version is that Father assigned it to me as penance. That may sound bad, but it’s actually an improvement for me. My normal penance is to watch Son #9 so the rest of the family can participate in the liturgy. He and I wrestle in the narthax and engage in other forms of physical and mental challenge of one another. Sometimes I win. Anyway, a couple of people expressed an interest in hearing some samples of the singing, no doubt hoping it would be bad enough to go viral with their mockery penned high on the comment list. The Wife assures me that my singing is “not THAT bad” and that I manage to “blend” well with others. (Certainly that cannot be said of me in other contexts!) If you hear the tenor, you know that’s not me, that is The Organist responsible for the execution of my penance. If you hear a baritone singing well, that is me. If you hear a baritone singing poorly, that is someone who should never be allowed to sing in public again, penance or not. Here are a few samples from Holy Thursday. I’ll load some samples from Friday and Saturday as Son #1 can fit in editing time between dates.